Once again, my team and I will be “Cooking for a Cure” at Founders Day April 22-24. Come out and enjoy some barbecue and donate to help find a cure. Unfortunately, close to 42,000 Americans will be diagnosed with oral or pharyngeal cancer this year. It will cause over 8,000 deaths, killing roughly one person per hour, 24 hours per day. Of those 42,000 newly diagnosed individuals, only slightly more than half will be alive in five years (approximately 57 %.) This is a number which has not significantly improved in decades. The death rate for oral cancer is higher than that of cancers which we hear about routinely such as cervical cancer, Hodgkin’s lymphoma, laryngeal cancer, cancer of the testes and endocrine system cancers such as thyroid or skin cancer (malignant melanoma.) Historically the death rate associated with this cancer is particularly high not because it is hard to discover or diagnose but due to the cancer being routinely discovered late in its development. Another obstacle to early discovery (and resulting better outcomes) is the advent of a virus, HPV16, contributing more to the incidence rate of oral cancers, particularly in the posterior part of the mouth (the pharynx, the tonsils, the base of tongue areas) which many times does not produce visible lesions or discolorations that have historically been the early warning signs of the disease process. Often oral cancer is only discovered when the cancer has metastasized to another location, most likely the lymph nodes of the neck. Prognosis at this stage of discovery is significantly worse than when it is caught in a localized intra oral area. Oral cancer is particularly dangerous because in its early stages it may not be noticed by the patient, as it can frequently prosper without producing pain or symptoms they might readily recognize and because it has a high risk of producing second, primary tumors. This means that patients, who survive a first encounter with the disease, have up to a 20 times higher risk of developing a second cancer. This heightened risk factor can last for five to ten years after the first occurrence. 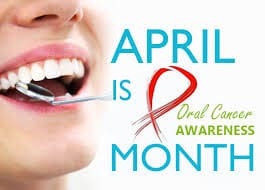 So don’t delay, make an appointment with your dentist for an oral cancer check during the month of April and tell your loved ones to do the same. Don’t forget to donate to help find a cure for cancer.